Christmas Updates in TrakIT ! Merry Christmas and a Happy New Year! This holiday season, we have several new updates in TrakIT. A major change is the way TrakIT handle Bill of Lading numbers (T/D or S/I). Previously, these numbers were applicable to work orders only and different shipments could have the same shipment number provided they were in different corridors. Now, the shipment number has become a unique number specific to each shipment. Two different shipments cannot have the same number. If you modify different shipments to have the same shipment number, you are in effect, merging them into a single shipment. Furthermore, all work orders in a shipment must belong in the same corridor. You will see a few changes relating to this. But for most part, the majority of the changes are internal to TrakIT. It is now possible to specify how Shipment numbers (T/D or S/I) can change (either one work order, all work orders or selected work orders). All work orders in shipment - This option allows users to change the number of all work orders belonging to this shipment. 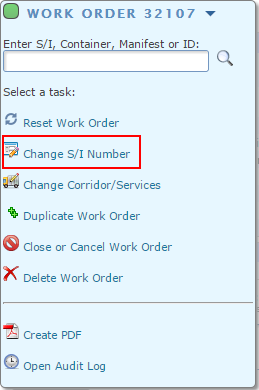 This work order only - This option allows users to change the number of the current work order. 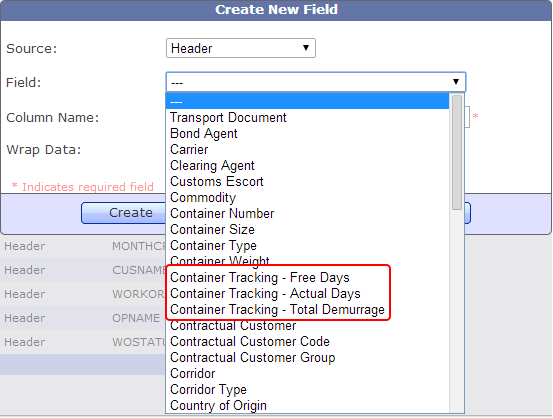 Selected work orders in shipment - This option allows users to change the number for partial shipment. When this option is selected, a list of all the work orders belonging to this shipment is displayed and the users can select the work orders for which the number should change. TrakIT checks if the new number entered by the user is already present or not. In case there is already a shipment with that number, then users can merge more work orders into that shipment by selecting 'Allow Joining with Existing Shipment'. Please note that 2 shipments can be merged together only if they belong to the same corridor and users can change number only within 2 months of work order creation. When creating new work orders, users must now specify whether the work orders to be created are a new shipment or to be added to an existing shipment. When adding to the an existing shipment, TrakIT will check to make sure that the corridor of the existing shipment matches the new corridor specified. Administrators can select an Event or Data field in the Master tables and all events and data fields from various corridors are displayed right there, where they can be modified as usual. This allows you to compare and align names and codes for the same master event across different corridors. The same can be done for Form Definitions, KPI Definitions and Entity Groups. For any queries, please feel free to contact TrakIT Support. 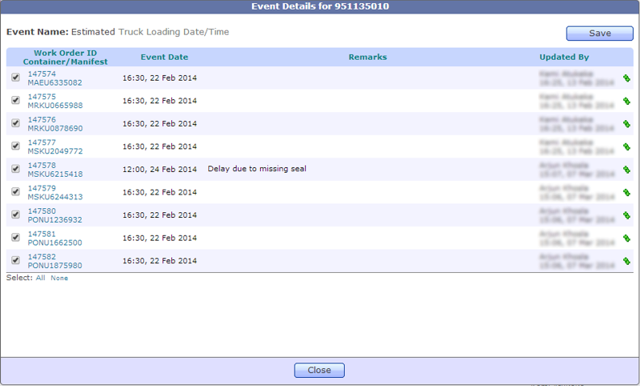 As per the system log, we're noticing that a lot of users update events or data one by one on shipments with multiple work orders. For most events, 'Apply to T/D' does the trick when the event happens at the same time for all work orders. But where the values are different, users are entering these values one by one. For example: A shipment has 15 work orders and these have been loaded on trucks. Each work order will obviously have a different truck number. Users open one work order, enter the truck number on the Data section and then switch to another work order to do the same. This is done 15 times to update all truck numbers. This is absolutely unnecessary! In the above example, all truck numbers can be updated simultaneously. On any one of the work orders, click the event/data name and a popup opens displaying the data for all work orders in the shipment. Once you have updated the relevant fields, you can click 'Save' to update all work orders in one go! In case of some events or data fields, you can also copy values from one row to other selected rows by clicking on the green plus icon. For example, if you wanted to populate "ABC" in all rows except the last two, just de-select the check-boxes on the last two rows and enter the value "ABC" in any of the remaining rows and click the green icon on that row. For any assistance or clarifications, please contact TrakIT Support. It's been coming a while and we've finally disabled IE 7 support for TrakIT. TrakIT will now refuse any user who is using any browser that identifies itself as IE 7 or earlier. IE 7 and earlier browsers are known for extremely buggy behavior that require countless developer hours to make simple page layout work properly. Even later browsers (IE 8 and 9) can use compatibility mode that makes them behave like IE 7. This mode can be set by default for Intranet sites. If you are still having any issues with your browsers, please contact TrakIT Support and we will assist you immediately. The Broadcast Messages feature allows Administrators to broadcast a message (along with an optional attachment) to a group of people. This group can be all TrakIT users, customers, transporters and agents of specific countries. Go to System > Broadcast Messages to see the list of all the messages that have already been sent out along with the date and time of their broadcast. Click on the message to view the details and the recipients it was broadcast to. 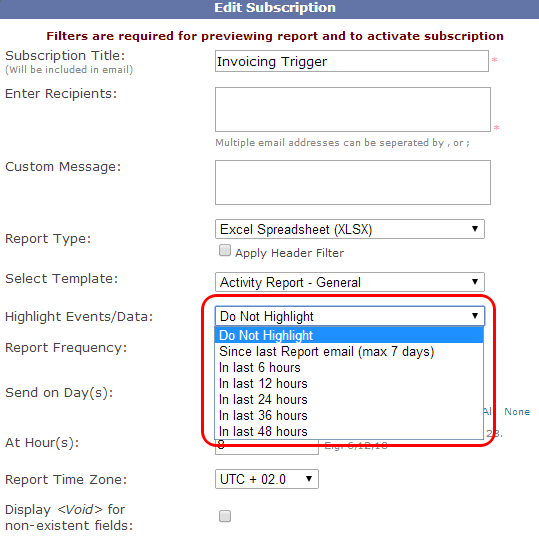 Under the Recipients section, select one or more Entity Types, User Roles and From Countries. Enter a subject in the Subject section and information that you need to broadcast in the Content section. If you need to attach any document with this message, you can do so by selecting a file to include with the message (max 1 MB). Once the message is ready, click on the Send button and the message will be emailed to all the selected recipients. Note: If you have selected any of the Entity Types as recipients, then you are allowed to select a maximum of four countries. For further queries and questions about this feature, please contact TrakIT Support. As an example, a report was generating about 19,000 rows with 24 columns of data - that is about 456,000 data items in one single report! The resulting Excel file was a few megabytes in size and was being sent out daily. Upon investigation, we found that the filters for the subscription were set incorrectly, thereby causing large amounts of data to be included in the report. With the latest update of TrakIT (released last Saturday), we've included a way to measure how long a report takes to generate. Under the Advanced Reports subscriptions, you will see a column "Last Gen" that indicates the number of seconds that the report took to generate the last time it was sent or manually generated. The "Generation Time" filter is currently visibly only to System Administrator - but it will be made available to all admins shortly. 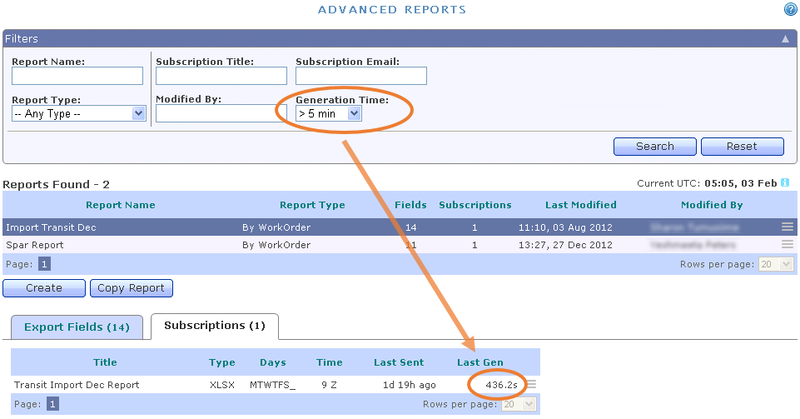 We recommend you go through your subscriptions to see how long the last report took to generate. If you find the figure missing, it will be updated the next time your report is sent out.